The bar chart finely depicts the proportion of travelers using 4 means of transportation in 3 different years: 1960, 1980, and 2000 in one European city. From an overall perspective, while there were fewer people travelling to work by bike or on foot, cars were gaining in popularity. To begin with, in 1960, cars were the least popular form of transport, with only 7% of the population drove them to work. In contrast, approximately one third of the city dwellers arrived at work on foot. The proportion of those who used bus and bikes were 20% and 27%, respectively. It can also be observed that the number of cars drivers had outstripped those of the reaming three categories, due to a prominent increase to 37% between 1980 and 2000. In terms of buses which were the most prevalent mode of transport in 1980, its percentage had dropped to only 18%. Bikers demonstrated the most dramatic decrease as it plunged by a massive 15%, compared to an 8% fall of the number of people walking to work. The bar chart finely depicts (represents) the proportion of travelers using 4 means of transportation in 3 different years: 1960, 1980, and 2000 in one( a specific ) European city. From an overall perspective (In general), while there were fewer people travelling to work by bike or on foot, cars were gaining in popularity. To begin with ( khỏi cần cũng được), in 1960, cars were the least popular form of transport, with only 7% of the population drove them to work. In contrast, approximately one third of the city dwellers arrived at work on foot. The proportion of those who used bus and bikes were 20% and 27%, respectively. Còn mấy cái chính tả nó chỉ là typo thôi :) mình chuyển từ giấy ra máy nó có hơi sai sót 1 tý còn trong bài thật vẫn đúng. 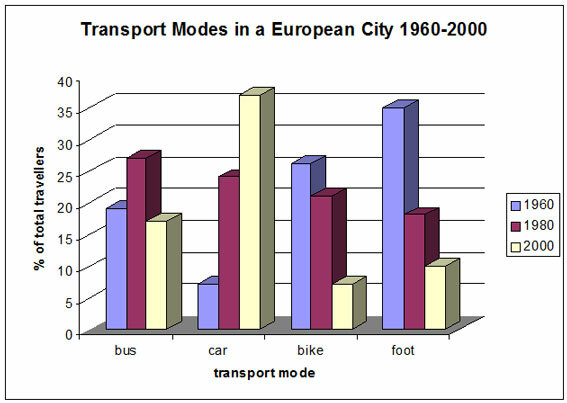 The bar chart compare the percentages of travellers using 4 different transport modes to and from workplace in 1960, 1980 and 2000. As can be seen, in 2000, cars became the most popular mean of transport, while walking, in 1960, was the prefered choice by majority of the public. In details, the proportion of peoplle using cars was only around 7% in 1960 but this figure increased by threefolds in the next 20 years to 22% and continued to rise with a record at over 35% in 2000. In contrast, travelling on foot was prefered by nearly 35% of travellers in 1960. However, in the next every 20 years, this statistic dropped by half, namely 17% and 8% in 1980 and 2000 respectively. Furthermore, bus was dominant as a transportation option for commuters in 1980, at 26%, whereas the years 1960 and 2000 shared similar figures for bus, 18% and 16% consecutively. Lastly, 25% of travellers used bikes in 1960 but since then, there was a significant decrease in popularity of this transport mode with notable record of 7% in 2000.